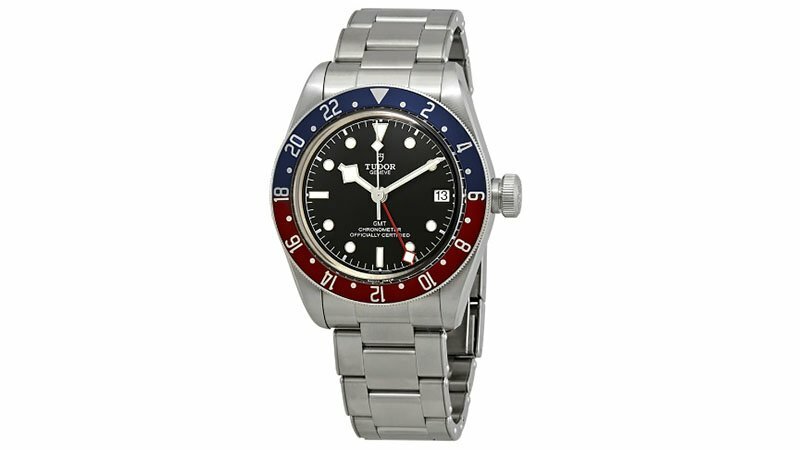 For busy men who are always on the go, a GMT watch is a must-have accessory. What sets a GMT watch apart from other timepieces is its ability to display time in two different locations. Providing instant time-telling as well as a host of useful features in a stylish package, these watches are functional and modern. As such, they’re perfect for everyone from adventure-lovers to businessmen and all those in between. So, if you’re looking for a versatile new watch, you should choose one of these stylish GMT designs. This unique gold and green design of Rolex’s GMT Master II Watch isn’t the only reason to add this timepiece to your collection. Along with being head turning, this watch is also incredibly sturdy. 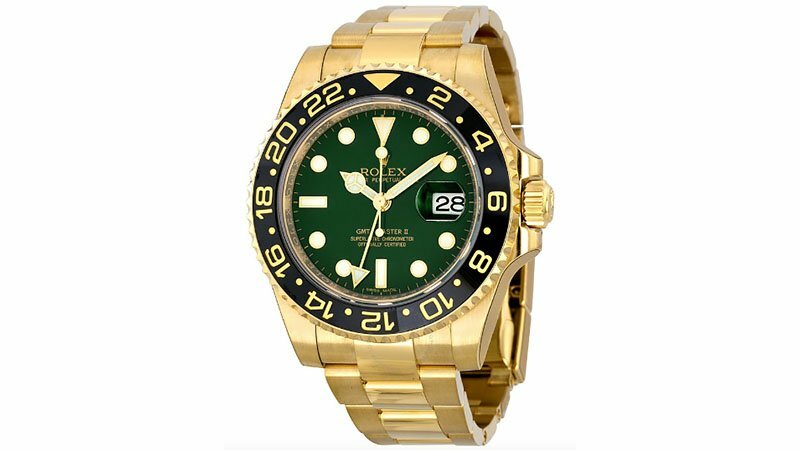 It features an 18k protective yellow gold case, oyster bracelet and bi-directional rotating bezel, green dial with yellow gold-tone hands and luminous hour markers. It boasts an automatic movement, scratch-resistant sapphire crystal, deployment clasp and water resistance to 100m as well as hour, minute, second and date function. The IWC Pilot GMT Automatic Watch is designed to endure a life full of adventure. Along with being water resistant to 60m, this tough timepiece features scratch-resistant sapphire crystal, an automatic movement and 68 hours of power reserve. Of course, it’s also seriously stylish and practical. 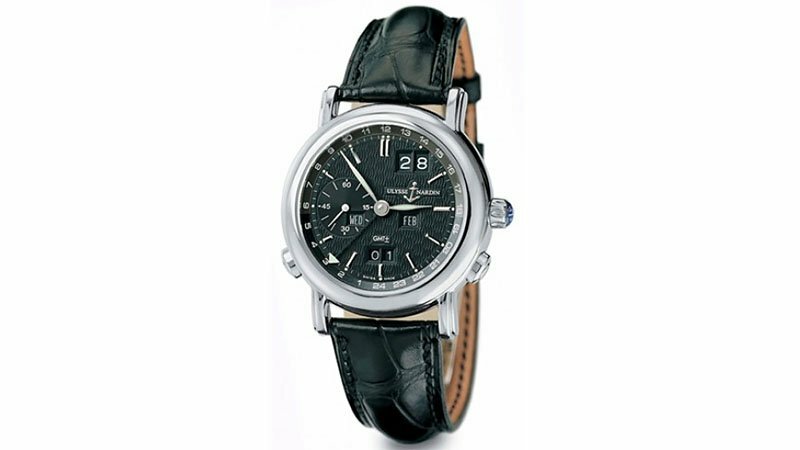 The Swiss-made watch boasts a stainless steel case and black embossed leather strap as well as a black dial and black hands with Arabic numeral hour markers. 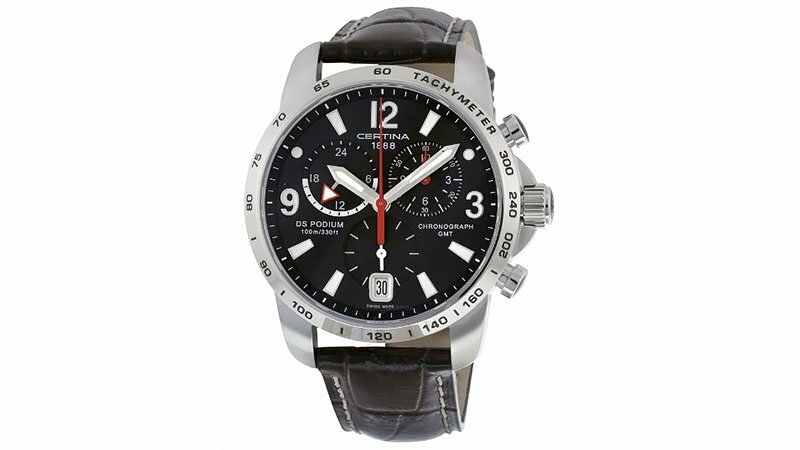 Timekeeping features include a chronograph function with 60-second, 60-minute and 12-hour display. Plus, the watch features dual-time zone and date functions. Function and comfort meet luxury with the Swiss-made Breitling Avener II GMT Watch. This long-lasting timepiece offers unmatched longevity, featuring an automatic movement with 42-hour power reserve, scratch-resistant sapphire crystal and 43mm stainless steel case. Plus, it is water resistant to 300m. The beautifully designed watch pairs a black diver pro rubber strap with a black dial and luminous silver-tone hands and index hour markers. Finally, it features a bi-directional rotating stainless steel bezel, screw locked crown, solid case back and tang clasp. 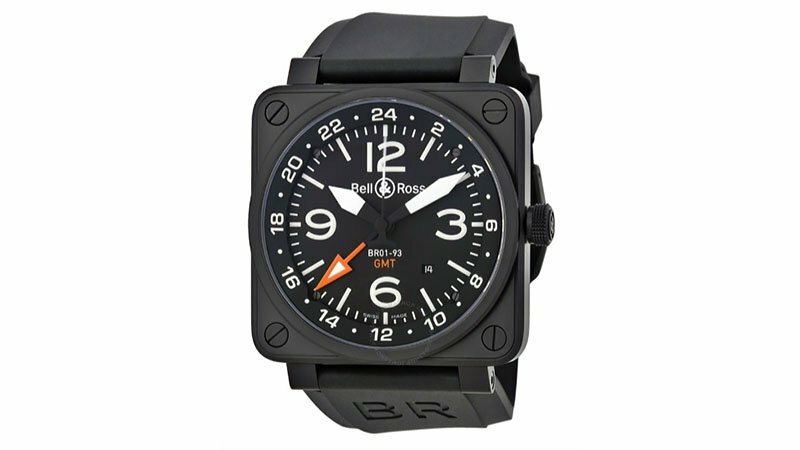 The Bell and Ross GMT BR-01-93 Watch boasts a durable yet fashionable design. The analogue timepiece features a black ion-plated stainless steel case with a black rubber strap, fixed bezel and black dial. It boasts luminescent hands and markers for an easy-to-read design. With scratch resistant sapphire crystal, a screw down crown and solid case back, this sturdy watch is built to withstand tough conditions. A 40-hour power reserve is paired with automatic movement, contributing to the incredible functionality of this piece. Additionally, it is water resistant to 100m. The Maurice Laxroixm GMT Watch merges a functional design with a sleek finish. A 40mm stainless steel case and stainless steel bracelet come together with an opaline dial with silver-tone hands and Roman numeral hour markers. The watch features a 42-hour power reserve, fixed stainless steel bezel, water resistance to 50m and scratch-resistant sapphire crystal to ensure the ultimate endurance. This expertly crafted Swiss-made watch also incorporates automatic movement, a pull/push crown, transparent case back and fold over clasp. 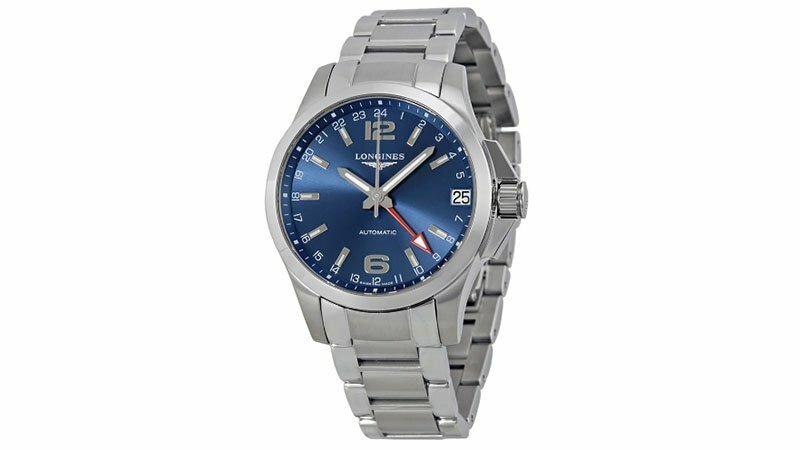 The Longines Conquest GMT Watch is the perfect companion for the classic man. The beautifully designed stainless steel timepiece features a silver-tone bracelet, blue dial with silver-tone hands and hour markers, 24-hour markers and minute markers around the outer rim. Arabic numerals and luminescent hands and markers ensure accuracy and easy readability. Durable features include an automatic movement, 48-hour power reserve, 41mm case, scratch-resistant sapphire crystal and water resistance to 50m. Additionally, the analogue timepiece harnesses date and dual time zone functions. As functional as it is fashionable, the Ulysee Nardingmt GMT Dual Time Automatic Watch harnesses a stunning design. The timepiece pairs a sturdy 42mm stainless steel case with scratch-resistant sapphire crystal for a flawless finish. 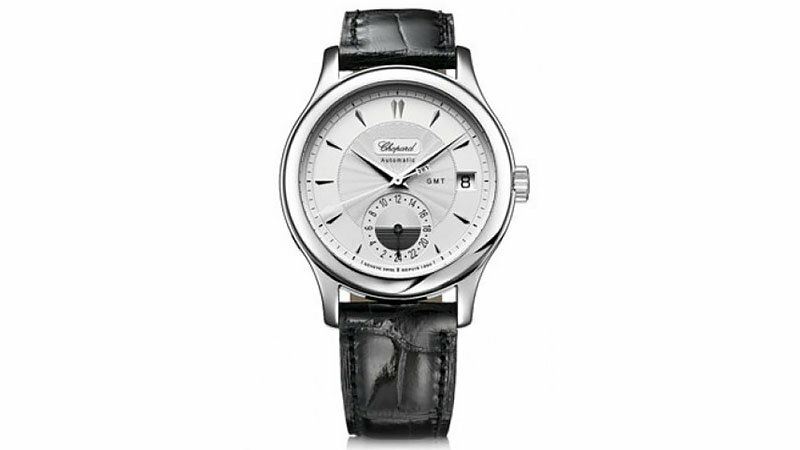 Additional features include a silver dial with luminous black hands and index hour markers, automatic movement, a screw down crown and transparent case back. To finish, a deployment clasp with push-button release comes together with a black alligator leather strap. As well as telling the time, the watch is water resistant to 100m. For an elegant look with a comfortable fit, the Certina DS Podium GMT Watch is the way to look. Ideal for everyday wear, this timepiece pairs a stainless steel case with a brown leather strap. A black dial with luminescent hands and index hour markers, date display and quartz movement ensure a simple, easy-to-read design. With scratch-resistant sapphire crystal and a solid case back, the watch is perfect for the adventurous man. Finally, it is water resistant to 100m and harnesses 60 second, 12-hour and 24-hour function on a three sub-dial display. 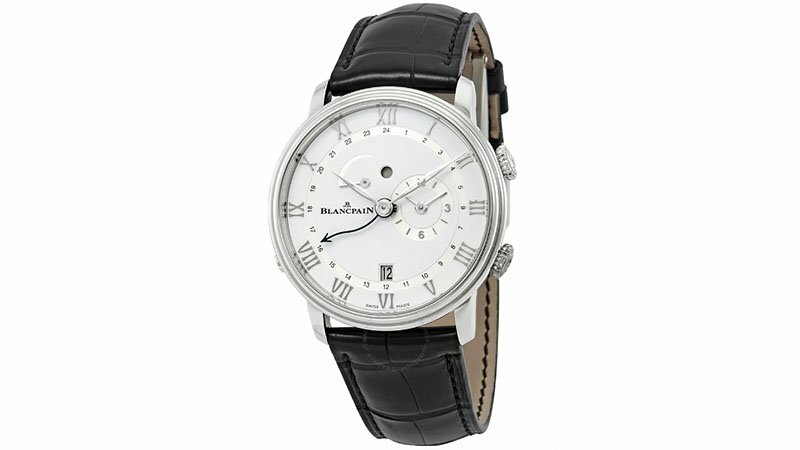 The Blancpain Villeret Reveil GMT Alarm Automatic Watch is a true all-purpose watch that will be your reliable wrist companion for years. 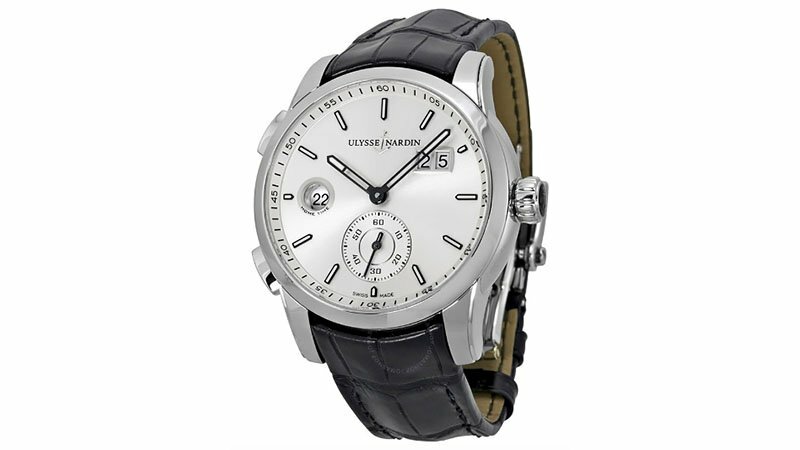 It features a white dial with silver-tone hands and Roman numeral hour markers, stainless steel case with black alligator leather strap and fixed bezel. The timepiece harnesses an automatic movement with approximately 45 hours of power reserve and features a dual time zone function. Plus, scratch-resistant sapphire crystal and water resistance to 30m promise high levels of durability. 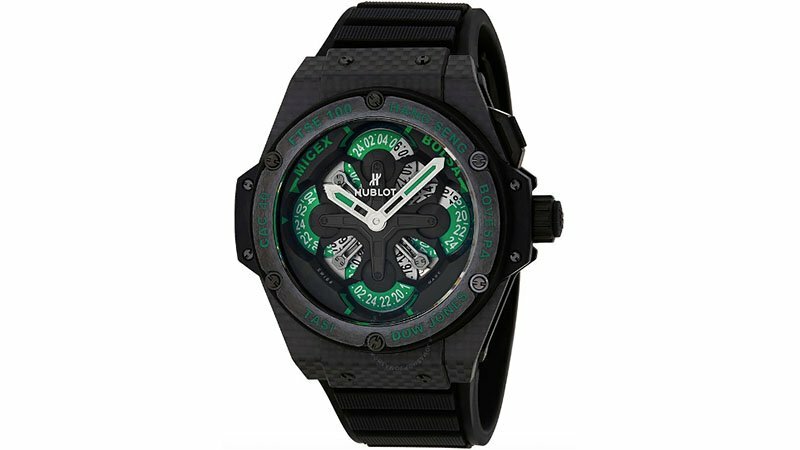 The Hublot King Power GMT Chronograph Watch is the perfect companion for the man on the go. With a carbon fibre case, rubber strap and fixed carbon fibre bezel, this all-black timepiece is as sleek as it is sturdy. A black dial is paired with luminous silver-tone hands and scratch-resistant sapphire crystal for a practical yet stylish finish. 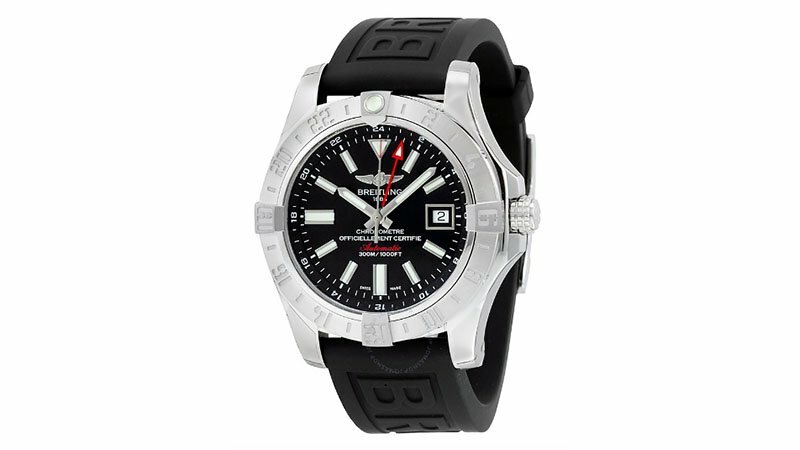 Timekeeping features include four time zone displays and a chronograph function. As well as water resistance to 100m, the Swiss-made watch features a tang clasp and screw down crown. 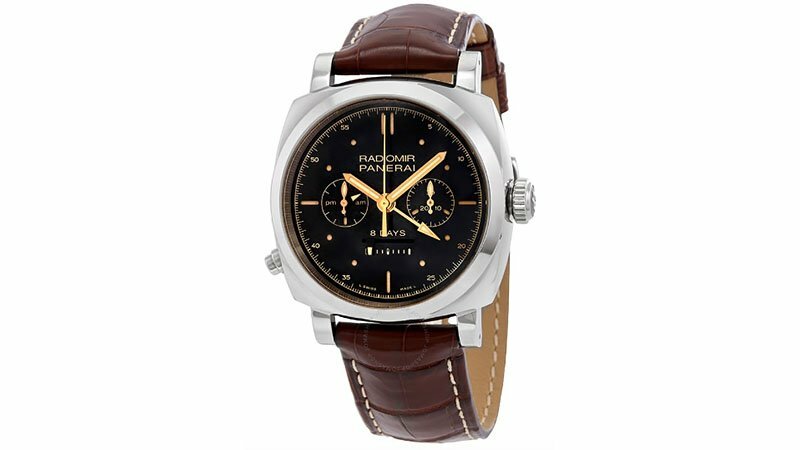 For a watch that evokes strength and sophistication, the Panerair Radiomir Chrono Monopulsante GMT Watch is the ultimate in masculinity. This Swiss-made timepiece features an 18kt white gold case with a brown alligator leather strap and fixed 18kt white gold bezel. Additionally, a black dial contributes to the incredible design of this piece, which is rounded off with luminescent rose gold-tone hands and hour markers. Featuring a 192-hour power reserve, dual time zone, hand wind movement and scratch-resistant sapphire crystal, the watch is water resistant to 50m. 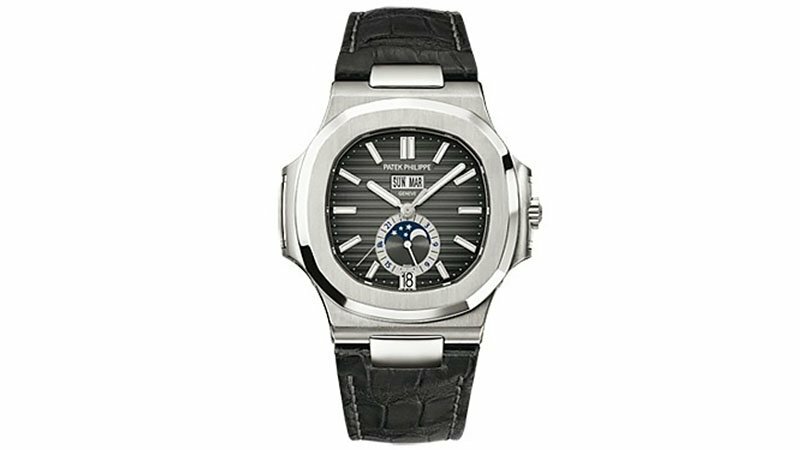 Smokey black elements and shining silver come together to create the Patek Philippe Nautilus Automatic GMT Moonphase Watch. This incredible timepiece features a stainless steel case and a crocodile leather strap, brought together with a black dial and luminous hands and markers. Harnessing an automatic movement and 45-hour power reserve, the watch features scratch-resistant sapphire crystal. Additional features include a skeleton case back, fold over clasp with safety and water resistance to 120m, as well as dual time zone and moon phase functions. 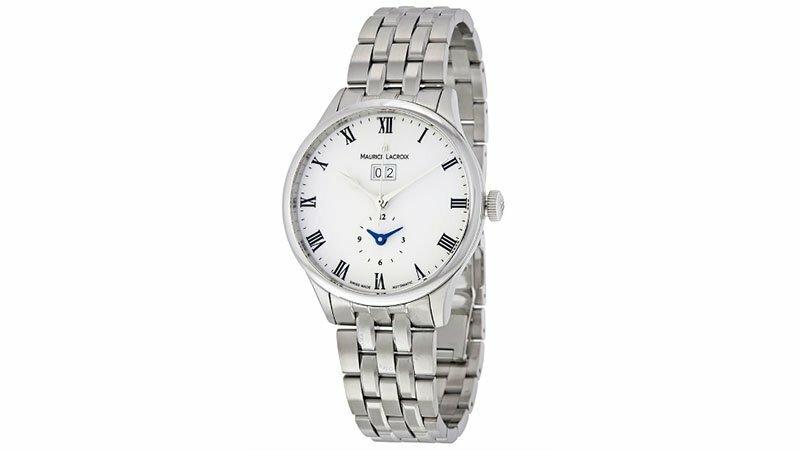 Looking for a watch that is as practical as it is chic? 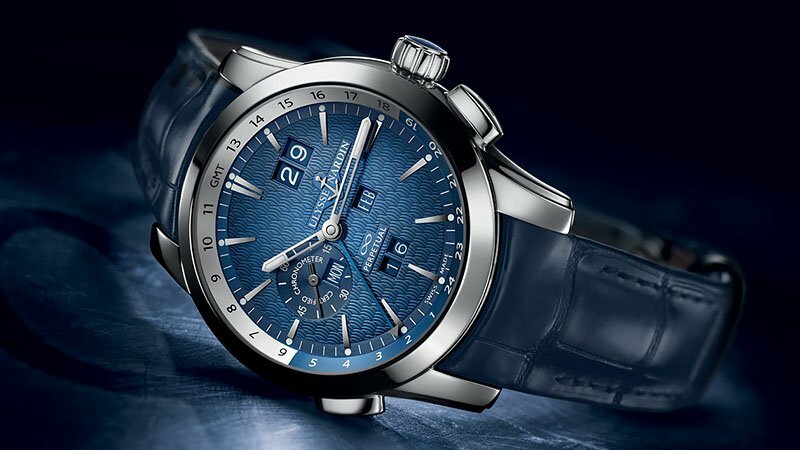 Look no further than the Chopard L.U.C. GMT Watch. This timepiece certainly boasts a tough design with scratch-resistant sapphire crystal, a 38mm case and water resistance to 30m. Not only will it stand up to almost every adventure, but it will look sophisticated and stylish while doing so. Aesthetic features include an 18k white gold case and black alligator leather strap, fixed 18kt white gold bezel, silver dial and silver-tone hands and hour markers. The watch also includes dual time zone and date functions, deployment clasp with push-button, automatic movement and a 65-hour power reserve. The ultimate companion for the modern man, the GMT Perpetual Ulysse Nardin GMT Perpetual Watch provides a practical and timeless design. This Swiss-made timepiece features an 18kt white gold case with black leather strap and a black dial with silver-toned hands, index hour markers and minute markers around the outer rim. This expertly crafted watch also incorporates a date display, fixed bezel, pull/push crown, deployant clasp and perpetual calendar. Plus, it is Swiss-made and harnesses an automatic movement. All of these factors contribute to the astounding craftsmanship of this versatile piece. 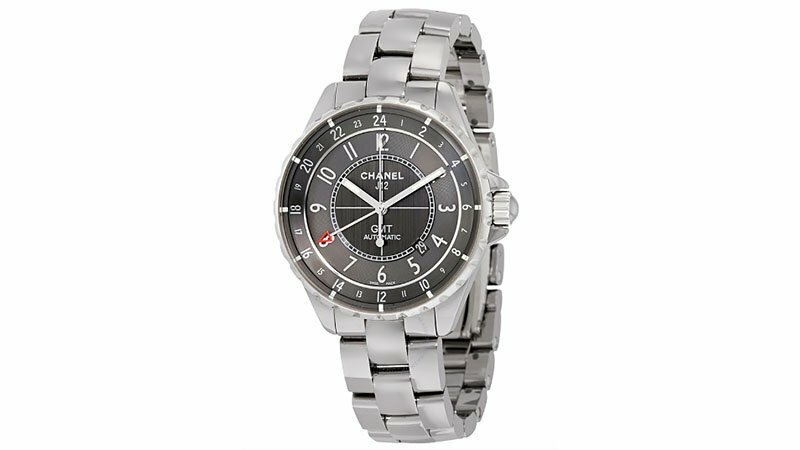 If you’re the type of man who prides himself on his appearance, then the Chanel J12 Chromatic GMT Automatic Watch is your kind of watch. Along with being water resistant to 100m, this luxurious timepiece has a 42-hour power reserve and harnesses a self-winding automatic movement. It features a titanium ceramic case and bracelet, fixed bezel with 24-hour scale, charcoal dial with silver-tone hands and Arabic numeral markers, minute markers around an inner ring, dual time zone function and date display. Finally, scratch-resistant sapphire crystal, a solid case back and triple folding buckle clasp promise strength and protection. 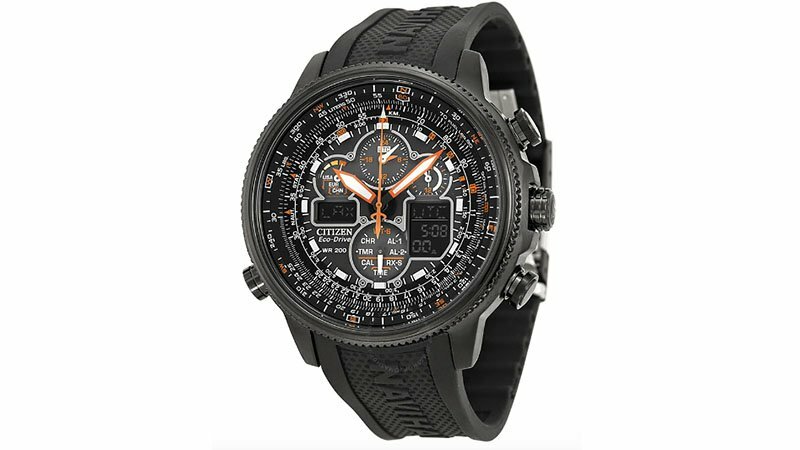 The Citizen Promaster Navihawk A-T Eco-Drive GMT Watch combines classic outdoor styling with a sporty design. Ideal for the active wearer, the watch features a Citizen Caliber Eco-Drive U680 movement, scratch-resistant mineral crystal and 48mm protective stainless steel case as well as water resistance to 200m. 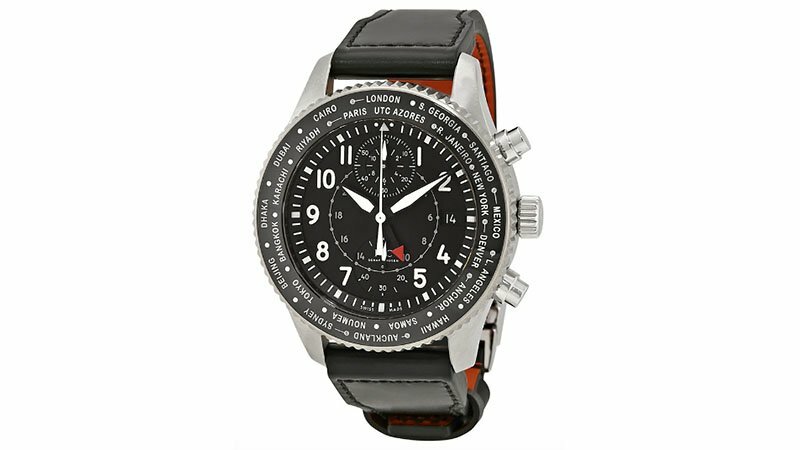 It also boasts a comfortable black rubber strap, fixed ion-plated black stainless steel bezel, black dial, luminous orange hands, index hour markers and minute markers around the outer rim. The timepiece features an easy-to-read design with both analogue and digital function. Finally, it harnesses atomic timekeeping technology with synchronized time adjustment, a power reserve indicator, world time and multiple alarms. 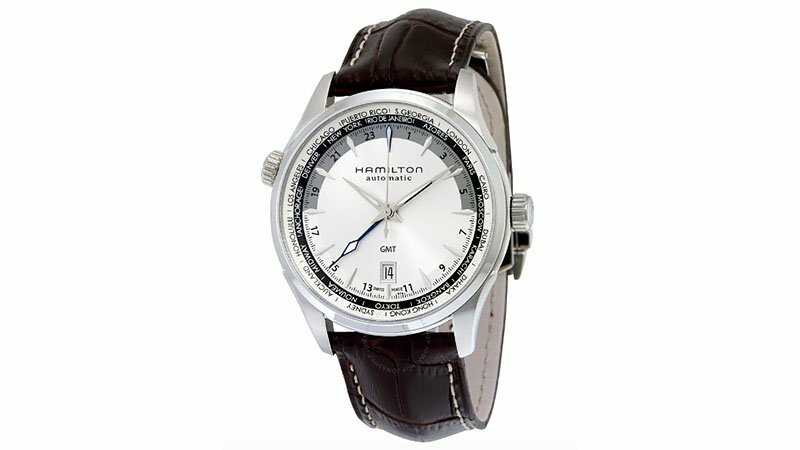 Sleek and sharp, the Hamilton Jazzmaster GMT Automatic Watch is an impeccable timepiece. A stainless steel case and brown leather strap combine with a silver dial and silver-tone hands and index hour markers for a smooth finish. Additional features include 24-hour markings, minute markers, a world time function, and 42-hour power reserve. As well as being water resistant to 50m, the watch features a fold over clasp, 42mm protective case and scratch-resistant sapphire crystal. Finally, the watch harnesses an automatic movement. The Tudor Black Bay Automatic GMT Watch is both functional and stylish. Meeting practical needs, it features a 70-hour power reserve, Tudor MT5652 automatic movement, dual time zone function and date display. With scratch-resistant sapphire crystal and water resistance to 200m, this timepiece is built to last. When it comes to aesthetics, a silver-tone stainless steel case, black dial and silver-tone steel bracelet make a polished statement. Finally, a bi-directional rotating burgundy and blue bezel also adds to the overall elegant design. The Omega Planet GMT Watch is the ultimate accessory for the sleek, sophisticated man. The luxurious Swiss-made timepiece features a blue dial with luminous silver-tone hands and index hour markers. 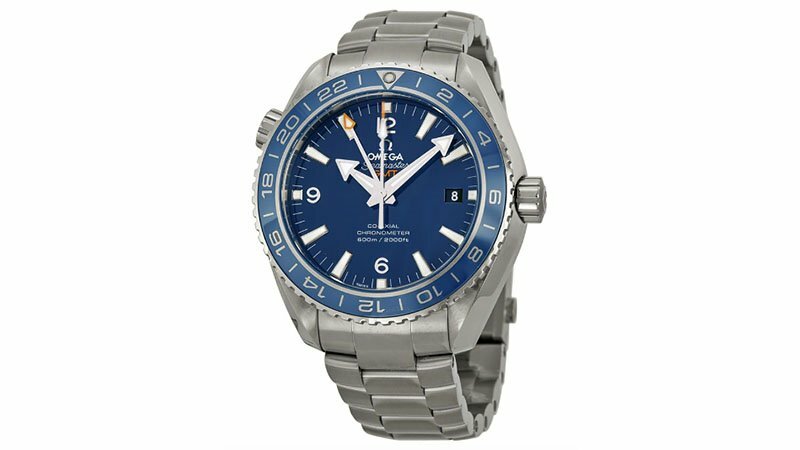 Additional features include a titanium case with a titanium bracelet, fold-over clasp with a double push-button release and bi-directional rotating titanium bezel with a blue ceramic top ring showing 24-hour markers. The watch is built for endurance, with a 60-hour power reserve and automatic movement. With water resistance up to 600 metres, it will see you through the rigours of underwater adventures. 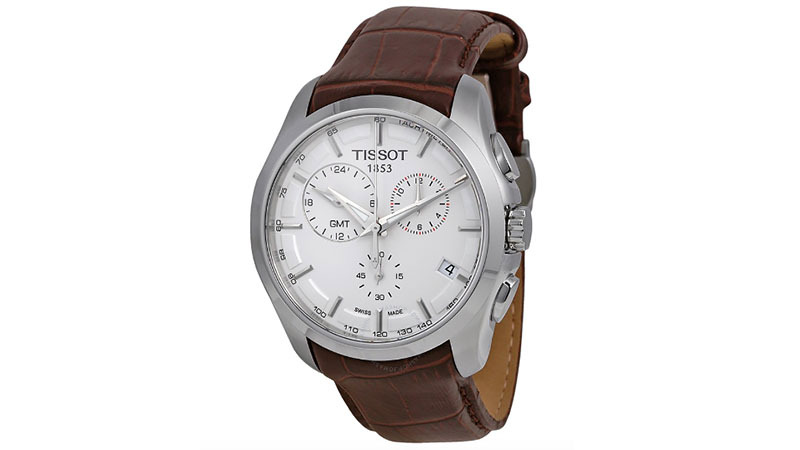 A stainless steel case and brown leather strap come together to create the Tissot Couturier GMT Watch. Polished, durable and incredibly stylish, this stunning timepiece features a fixed silver-tone bezel and white dial with luminescent silver-tone hands and index hour markers. Built for endurance, it harnesses scratch-resistant sapphire crystal, a screw down crown, solid case back and water resistance to 100m. Additionally, the watch boasts a quartz movement and has 60 second, 12-hour and 24-hour displays.